Hey all, as you will all be aware Roger got his hard court swing underway with a straight sets victory over Philip Kohlschreiber under the bright lights of Cincinnati which was good to see. It's the first time we've seen him in action since Gstaad due to his withdrawal from Montreal and after 3 tough losses in under a month it's good to see Fed back to winning ways however I left this match with mixed feelings as to actually how positive it actually was which I'll discuss below. But first the match at hand as Roger maintained his peRFect H2H record against the German with a 6-3, 7-6(7) victory. I think everyone was slightly skeptical to how this match would start – would the game click? Was the back ok? Why was he using the old Pro staff racquet? Well it all turned out pretty well in the first set with Roger starting quite nicely on serve with 2 love holds to move into a 2-1 lead. At 2-1 he created his first break point chances at 15-40 only to waste them both with a chip charge and then a forehand pass wide into the tramlines. He went onto waste 4 more with passive returning and allowed Kohlschreiber to hold. As is often the case when Roger fails to take advantage of multiple break points he found himself in trouble in his own service game and only a crisp volley at 0-30 got him out of trouble. The next game Kohlschreiber gifted Roger the break from 40-15 up serving a double fault at deuce and then making a weak unforced error from a mid court ball. Roger backed this up with a nice hold to lead 5-2 and then served it out to take the set 6-3. All in all it was a reasonable set, there were some nice moments and crisp forehands, the returning was yet again average and really the lack of game plan from Kohlschreiber aided Roger's cause quite significantly. The second set was the reverse as Roger's game went off the boil completely and he missed an easy overhead before serving a double fault to get broken at 2-3. However Kohlschreiber handed the break straight back with an exceptionally poor service game that ultimately cost him the set. Roger had more break point chances in the next service game but couldn't take them and the set went into a tie break. The tie break was topsy turvy with both guys swapping mini breaks, Roger had to save set points at 5-6 and 6-7 before eventually sealing it 9-7 when he hit a nice forehand down the line on the run. Like I said above this was a match of mixed feelings for me personally, I'm glad Roger looked like he is over any sort of back problems for now and could play freely, it was also pleasing that he got the much needed win but on the other hand I'm very disappointed he has reverted back to the old Pro Staff racquet after testing the new Prototype post Wimbledon. It wasn't a bad match and the outcome is positive for sure but as usual Federer fans think 1 win makes everything hunky dory again and suddenly he is back to his best. 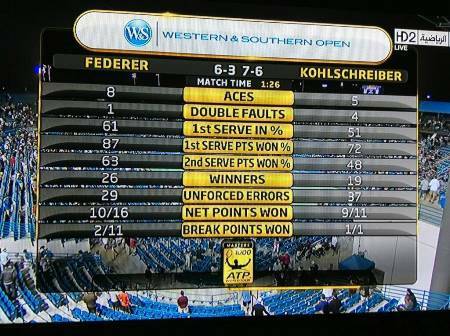 I happen to think Kohlschreiber played a very poor match and even Roger way below his best was enough to get the job done. Many of the matches we've seen Roger lose lately the opponent has come in with a clear gameplan whereas Kohlschreiber turned up to just hit a few balls before rolling over. He had no real plan of what needed to be done and lacked any sort of consistency or tactical play, the only points he won were courtesy of poor returning, chip charging or errors from the Federer racquet. So yes, it was good to see Roger winning, but I don't actually see this as a huge forward step. The reason for that is the racquet and why Roger had suddenly reverted back to the Pro Staff. Now I was never really a huge advocate of the equipment change when it reared it's head again last year, mainly because Roger 3.0 had been around for 12 months and I didn't think it was necessary because he'd won 17 slams with it. However, the more it got talked about and with the change eventually coming after Wimbledon the more I liked it and the more it made sense. I'm now at the point where I think switching back is the worst possible idea from Federer's perspective, it is almost like he has bottled it here and gone back to his security blanket that is the Pro Staff. I know many of you will say ah it's the right decision, who are you to tell Roger what he should do, it's too late to change as it's won him many matches but without risk there is no reward. There's no risk in playing with a 90sq” racquet that's accompanied him for over 1000 matches, it is like a crutch, sticking with what he knows and refusing to adapt to the modern game. I just felt like, you know what, I’m going to play with the old racquet through the US Open right now, and I’m going to do more racquet testing when I have, again, some more time after the US Open. Yeah, I was playing for a month with the black one, but it’s a prototype. At the end, I just felt like, you know what, right now I feel like I need to simplify everything and just play with what I know best. I have too many things on my plate right now. So I just said, I want to definitely do my racquet testing and play more with the prototype, but right now I just wanted it to be about forehands and backhands and nothing else. I fail to see how the Pro Staff keeps things simple, all it does it keep things the same, there is no change, or adaption here, just plodding along – yes he can train harder, put more hours in but I think a new racquet here could have given him the edge when he needed it most. Using the prototype up until now has almost been rendered pointless as by the time he uses it again he will have forgotten everything about it anyway. If he has a good USO, he may not even test it again which is a big worry. If we look at last nights match there still plenty frailties out there and only Kohlschreiber's lack of mental fortitude and tactical nouse allowed him to get it done in straights. 2 out of 11 on break points, weak returning and quite a lot of errors in the second set doesn't make good reading; against more consistent baseliners he could and will most likely come unstuck. I also worry about his return game with this racquet more than ever, we've all been saying he needs to be more aggressive for what seems like forever, and after reading Ru-an's post about Roger's weak slice return and the need for more aggression I thought about it in much more depth and completely agree. This could cost him matches, it clearly effects his break point conversion as he always plays it safe and allows his opponent to start from either a neutral or offensive position, we saw countless times last night where he chipped the return and then was on the defensive or forced into error. He even floated the ball long on a couple of occasions which is criminal. The chip return also leads me to believe that Roger isn't taking heed of his coaches advice, if we look at other players who Annacone has coached over the years he has always made them more offensive on the return. Look at Sampras in the video below, he has nowhere near the level of technique that Roger possesses, you could even say his backhand has technical flaws, yet he went full blooded on the return. To him it didn't matter if he missed returns by being aggressive, he knew that if he connected with 4 good ones in a game then he gave himself a better chance of breaking. Roger is at the opposite side of the spectrum, he will play safe, chip into play, just content to get the rally started, yet it's costing him points and even more so against the top guys. If you're facing Federer, and you keep holding serve even if you get taken to 30 then you will start to get confidence which then gives you more chance of breaking serve yourself, we see this with Berdych, Nadal and most other consistent baseliners. Annacone even made Henman into a more aggressive player both on the serve and the return, so that's clearly his preferred style of play, I find it unrealistic he'd suddenly be content with Roger chipping the return when none of his other pupils have. It probably boils down to the fact that Roger will be the most stubborn of the lot of them, he still thinks he can use his old school style to win matches, which he can, but against the big boys and an increasing number of players inside the top 20 he is falling short. No doubt fans will think I'm being negative here, but it's quite the opposite, I'm just thinking about long term and what he must do to win important matches. Beating whipping boys like Kohlschreiber isn't going to win him tournaments, he has to deliver against the guys who are currently thriving. I don't want to watch tournaments where he can beat mid tier opposition comfortably but then come unstuck against the likes of Nadal, Djokovic and Murray and I think the bigger racquet could make a huge difference against them. But, it looks like Roger's mind is set in stone and he will use the Pro Staff right up until after the USO before trialling a new racquet again. I had a lot of optimism for the US Open but that's not quite the case anymore. He didn't become useless with the Pro Staff overnight and he still may do well but I think the riskier move was to switch racquets but one where the reward could have been far greater. Next up for Roger is his good friend Tommy Haas who has made a very solid start to the tournament, schooling both Kevin Anderson and Marcel Granollers in straight sets to setup an exciting clash. Haas is a very solid player and perhaps American hard courts are his best surface so he could be a danger here. He has a habit of rolling over when he plays Federer but he may threaten due to being more match sharp and taking advantage of Roger's lack of court time. I still make Roger the favourite but this could easily go 3 sets. Haas doesn't mess about lately and is still clearly playing inspired stuff so I'll pick Roger to win 6-4 4-6 6-3. Great Post Jonathan. But I have a question, why does Roger chose to chip the majority of his returns? It’s almost as if everyone can see it’s limitations but not him. I mean Kholschreiber didn’t have a great 1st serve percentage in the second set I think, but still there were hardly any break opportunities I don’t think. The blogging floor is yours Sid. Make it good. 2 – Break points: It’s almost always a chip because he wants the opponent to earn it. Roger believes in percentage play in those situation and sticks to it religiously, no matter how many such opportunities he lays waste. Better players have picked on it though and Roger refuses to change one bit with the way he plays those points. 3 – Single handed backhand: That makes it more difficult for Roger to get a controlled but aggressive return at the same time. A single handed backhand will never give as much control as the two hand version which simply gives too many options, specifically against high balls. After all, the two handed backhand is nothing but a forehand with the left arm being dominant (for right handed players). Two handed players do have certain disadvantages but the pros far outweigh the cons. With the serves getting bigger and bigger these days, the slice seems to be Roger’s best option. 4 – Maneuverability: Not only is Roger’s racquet smaller, it is extremely heavy, at least 12.7 oz. It’s just not possible to have enough preparation to go for an aggressive swing. Sure, the heavy stick gives a little oomph but evidently not enough for him to be really aggressive. He make things even more difficult by staying very close to the baseline when receiving serve making the chip the only option left really. 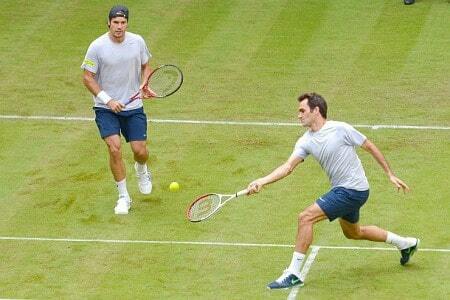 You may argue that Roger gets so much maneuverability with the backhand during rallies. That’s because there’s a lot more time to prepare and respond compared to a 125 mph or more serve coming to the backhand. 5 – Buying time: Chipping the ball back means you aren’t returning with good pace that the opponent can use to counter punch. That way, time is created, especially when stretched wide on the backhand wing. 6 – The last thing that comes to my mind: The split step immediately after you serve is almost always never in time. It will likely be a fraction of a second later that what you would like and at the same time you are recovering from the entire service motion. The bigger or faster you serve, the more exaggerated the problem. A chipped return is not an easy thing to handle in that situation (unless of course if you’re a Nadal who will just whip-moonball it over). If the slice is well placed, it will be difficult to deal with and will make the opponent rush and not allow him to execute a quality second shot. A short one would bring most in uncomfortably. To conclude, the equipment surely is not conducive to aggressive returning but the true reason behind the chip could be that Roger has figured out it’s the safer and more profitable play in the long run. It’s like a poker player calling only if the correct odds are received on the draw. No idea, he clearly thinks it is the better play, muscle memory, scared of missing? Dull will school him here, not good. Indian Wells 2013 part deux. I too wish I knew why he chips so many returns – it drives me nuts to watch him. As for the racket business, the only reason I could really understand it is if he doesn’t yet trust the prototype enough for whatever reason and doesn’t want to risk the USO on it. I agree that he’s not had that long with it, and maybe he does need a bit more time when things aren’t as hectic, but he certainly needs to get back to it, or something similar, pretty quickly. I’m wondering whether he’s actually thinking that a 98 is a bit too big and maybe a 95 would be a better compromise? I’ve been thinking: it must be pretty difficult being Fed in this situation. Him getting a bigger racket is Big News, and there’s no way he can just hide away and work on it like lesser mortals. It’s also really important that it works, and works well, whatever it is, because if it’s perceived not to work well, that will reflect poorly on Wilson. After all, if you’re going to manufacture a production racket which is in any way related to what Roger is using on court, then he needs to be winning big matches with it. If he does have a problem with the prototype, then he has to be very careful about how he expresses that in public. He used the chip so much against Kohlschreiber because the German plays better on high balls, and it paid dividends in the big moments. He hopefully will be more aggressive on the return vs Haas. I disagree, not disputing Kohli can handle high bouncing balls as he hits with western grip on the backhand but the guy is 5ft 10 so no way it was a conscious strategy on Federer’s part to try hit with slice. He does it vs. every opponent. It didn’t pay dividends in the big moments either – he could have lost the second set easily. But he did break back using the chip up the middle and Kohli netted it. He definitely needs to hit over more, but as a variant the slice can work. This is Federer being a stubborn idiot. I can’t fathom why he’d go back to the old racket, specially after spending a good one month training with the new one. Not only will his comfort level with the racket go back to zilch if he ever decides on reverting back to it, it will take some time to get used to the original racket. No doubt the change back to the ProStaff is going to be hard, simply because it’s a harder and more unforgiving stick. One month is a long period of time. In order to be competitive he had to move forward, and he’s just chickened out here. His return of serve is abysmal. And his lack of strategy is frustrating at times. I mean, I look at Nadal and every time he plays Novak, he’s tried to change something in order to beat him. And it’s finally started to work. And here’s good ol’ Rog, banking on his skill set alone to out hit every one and feed his ego by playing to his opponent’s strengths. Good last part to the comment man. I agree. Some fans just think 1 win sorts everything out but he needs get on a streak to build confidence. I don’t get why he trialed the racquet for so long only to choose against it. Lovely to see him back on court but why revert back to the old raquet, cannot believe that Annacone agreed with the move so you have to ask the question why will he not listen to his coach – its a bit like having a dog and barking yourself, I mean we all know he has a very big stubborn streak, but he needs matches and ranking points if he wants to get back to the top 4, would it not have been better to perservere with the new bigger raquet? Indeed, I can’t see Annacone not wanting him to hit through his returns. Just very stubborn. I think he has made a mistake using the old Pro Staff. I want to see him vs. Nadal though to see what happens. Jonathan CONGRATS, what a wonderful post, what an amazing analysis, I just have to say that I am 200% agree with you, Roger is not listening, it is a shame, Nadal for sure will school him, if is that he make it to the quarters. Annacone is telling him to change the racquet and be more aggressive on the return, but he just wont listen to him. Lets wait for the inevitable if he meets Nadull. Yeah I wanna see him play Nadal, wanna see what kinda difference there is. How he shapes up, can he dictate, will his chip return cost him. Serajul Islam! Where have you been? Yeah I think Roger is being negative here in his approach sticking with what he knows. Which is a shame. If it is going to be a hat trick of disasters, and there is every indication that’s what it would end up being, I’d rather take a 6-1 6-1 score line. The bagel will be a little too much to gulp down 😐 I hope Nadal shows some mercy. Haas could be a danger as I said, but he has rolled over many times despite looking in form. He hasn’t beaten Fed in Basel though. I think he said something about adjusting to keep up/change in general. If You don’t adapt, it’s not a step forward but backwards. I agree with Jonathan, this is a step backward. We all know that Roger is a bit comfortable with the 90 sq in because he used it for a long time compared to the prototype. Roger’s game will need improvements and that can be done by getting outside of your comfort zone. I thought he’s going to stick with the new racket, take some losses at this point and come back strong with the bigger frame come 2014. I just hope he does not scrap the plan of playing a bigger racket in the near future. Yeah I have no idea what Roger is doing with this choice. He has reverted into his comfort zone. I think he will lose early at USO now, don’t like to say it but looks more likely. What does he need to make him smell the Jura coffee? A 1st round loss at the USO? At this point in time, I think Roger has a lot on his plate. Whatever those things are..and he did mention it in his presser. I guess it’s a confidence thing. Don’t feel too good about the Haas match. He did say that, bit of a coded message really. Sounded like he meant off court. It’s not the first time he’s alluded to it this year, either, whatever “it* is. Hi Jonathan, good post as usual and to the point with no hesitations. Going back to the match. I saw the highlights as I couldn’t see the match. It wasn’t a bad match overall, and as most of the fans mentioned, his volley was solid. @ the end he go the “W” which is enough for the moment to build on. In regards to the racquet, I has discussion with my bro (he is a big FAN of Roger) before cincy and he doesn’t like the idea of roger changing his racquet and he said “ Roger should stick with his winning formula which is footwork, forehand and big serve”. I guess it’s difficult for him now as he is aging and that’s why he is thinking of something else apart of what is mention up there; however he is refusing to!! Yeah the win is good for sure, but I’m not getting carried away with. Mugschreiber was a tailor made opponent, Haas is a tougher test. I don’t think the new racquet sacrifices the forehand, footwork or big serve so I want him to change. An excellent post comme d’habitude. Well done, Jonathan, I agree with everything you said. I am saddened that he decided to go backwards as if he lost the match. I know I should be just grateful to watch Fed, he won the bloody match in straight but cannot help feeling disappointed. Nothing has changed… 🙁 I was like the Seinfeld guys on your ‘Story of Fed 2013 so far’ when he came out with a new racket. Although some analysed or explained well about the reason behind his decision, whatever he thinks now I just hope he doesn’t lose challenging/fighting sprit. Yeah I can’t work out why he did it. It seems strange he would trial it for so long and then suddenly just say no, actually, Pro Staff it is. I always thought so. More press talk from Dull. I don’t know if you guys read Mary Carillo’s interview regarding Fed. She knew that he would change back to his 90. If he truly believed that the current prototype racquet wasn’t working out and he thought he’ll play better with the 90, wasn’t it good that he changed back to what he knows best for now? Or should he really have played with a prototype that he wasn’t comfortable with? Then why trial it for over a month only to decide it’s no longer good enough? That thread is just speculation and clever photos, I could put a picture up of the Wimbledon 2012 final and Fed looks like he just lost in 5 sets lol. But yeah, It’s strange using it for a month and then changing back. No way he got injured courtesy of the new racquet, he’s had back troubles since 2003. 1 – He played two tourneys he wasn’t supposed to play with the new racquet. Things didn’t work out as well as expected. So, there’s no surprise he has shelved the new stick for a little bit. 2 – He believes the Pro Staff 90 is better suited the the court conditions expected over the next few weeks. You know, a horses for courses thing. 3 – Because he is perilously close to missing out on the WTF, he may have decided to stick with the the old racquet, maybe not win those tourneys but get enough of a safety net in terms of qualification points. It’s possible his newer racquet which is untested on hard courts may really hurt his chances. 4 – Or, as someone already pointed out, he things his fitness level has reached a certain intermediate target for him to be able to get better results with the PS90. Better results compared to recent form that is. Let’s relax! Ok, I know we should panic as Rafael “Doperman” Nadal awaits but for now, let’s relax and hope he gets past Haas. But why did he use it so close to his actual match? If he knew it wasn’t going to be the right racquet for him, why bother practicing with it? He’d have know long before that. WTF is a good point though, I didn’t think of that. Well, he gave it a shot, didn’t work out. Going back to the old racquet is always very easy. I’ve used new racquets for weeks then switched suddenly to the old faithful and everything felt fine. It’s gonna be a Haas-ache tonight, Haas-ache tonight, Lord I know! It is. Roger will still make the WTF by the slimmest of margins. It’s not over yet though, he may dig out of it. Yeah, he’ll dig it out, but I wonder whether it might be better for the confidence if he lost here. Much rather it be Haas than Dull. Good stuff in the last couple of sets. If Roger can get his head down tomorrow, play some shots, and knock Nadal’s water bottles over, we’re sorted for the win. Good vs. Evil Here Sid. The Dark Knight vs. Batman & Robin. I know that still wasn’t the most convincing performance, but credit where credit’s due, he crawled back from a very sticky situation after being 6-1 4-2 down. He used the resources he had and just found a way to grind out the win against a very solid player that Haas is. Now what does that remind me of, the way he ground out the win… Roger 3.0 anyone? Ok, it’s not quite Roger 3.0, but he’s not just going to get back to playing his best tennis in a flash, and he’s made strides today towards that in winning this match in that fashion. Optimism guys! If he can at least push Rafa, then recuperate as well as possible, he can go to NY relatively fresh. As fresh as he can be at least. I’m optimistic of a good indoor season, hopefully grabbing some Paris points so he seals WTF. Indeed, gotta give him credit for the match. Hope he can swing free vs. Nadal. That was a tough one! I was close to the heart attack when he missed those last break points in the decider… 3/13 isn’t that good… Not even close to RF level but he got the job done and that’s what matters now! Isn’t Dimitrov’s dream to play Federer? Couldn’t he then get us rid of Nadal tonight? Dimitrov has a realistic chance to beat Nadal. The surface suits his style and considering what he did to Nadal at Monte Carlo (was it? ), it could happen. But if I could come through it yesterday, I don’t think I will swallow any similar situation tonight! Alex, I almost never watch Roger vs. Nadal games. It’s a match up made in hell. I envision the serves and moonballs to Roger’s backhand and decide not to go through the mortification. Yeah I’d agree with that, if he has a good USO I can’t argue with his choice of racquet. Just not as confident as I was before. Anyway, see what happens I guess. Allez!